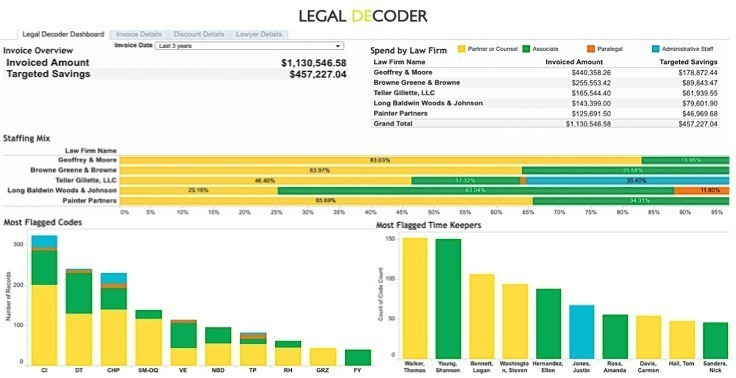 Corporate counsel are the target audience for Legal Decoder, a product launched last October that promises to identify inefficiencies in law firm billing by using data analytics to “decode” law firm invoices. The platform analyzes each line item in an invoice against sets of supplemental rules and industry standards. It then assigns flags to items that could represent problematic or inefficient charges. The platform would assign a flag, for example, when it identifies a more-senior lawyer doing work typically done by junior lawyers, or when it finds partners unnecessarily billing to review associates’ work. The platform is unique, its developers say, because it evaluates items not strictly according to billing codes, but by tasks. The program sets parameters for how long tasks should take and who should perform them, and it continues to refine its results the more a company uses it. The company was founded by Joseph R. Tiano Jr., a former partner with Pillsbury Winthrop Shaw Pittman, LLP, and Christopher J. Miller, an expert in database design and architecture, data warehousing and business intelligence and analytics.